As a provider of excellent solutions for forming and sealing cases and trays. EndFlex is pleased to present to you our Carton Forming Machine sytems. Our Boxxer 2200 case erector machine is designed to take RSC or HSC knocked-down blanks from the bottom of the hopper in order to transfer each of them to the erecting station of the machine. The process continues with the blank being erected and the two minor flaps are folded into the box. After which, the minor flaps will be glued down and the major flaps will be plowed down. The case enters the compression section. Finally, the process ends with a finished box discharged from the machine by the next box. Its features include a color touchscreen, easy load blank magazine, Nordson glue system, interlocked doors, nema 4 enclosures and SMC pneumatics. Another carton machine is our Boxxer Auto Lock case erector that automatically knocks down blank from the hopper magazine. Transfers it to the erecting station of the machine will erect, lock and deposit the carton into a conveyor for its discharge.This heavy-duty erector machine creates chipboard or corrugated cartons independently. 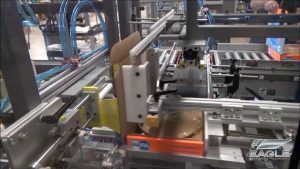 It can be interfaced as part of a fully automatic packaging line depending on the production requirement and demand. Some of its features include Omron PLC, heavy-duty steel frame, interlocked safety gates or doors. With Venturi vacuum technology, color touchscreen, and many more. The Boxxer All-In-One case loading system that erects, forms, loads, and seals cartons or cases that are loaded from the bottom.Our case loading solution under this machine undergo four steps, product collating, product staging, case erecting, and case seal & discharge, accordingly.Its special features include a color touchscreen, easy load blank magazine, tape or glue sealer, interlocked doors, nema 4 enclosures, and SMC pneumatic components. Finally, is the EZ Glue case sealer which will load the case into the machine. Fold the minor flops into the case While applying glue. Then the major flaps, and compress the case flaps tightly to ensure that cases are squarely well-sealed. The EZ Glue features a Nordson glue system, color touchscreen, pneumatics, and a lot more.